Become a member: Join our studio even as a complete “mosaic novice.” Work at your own pace and learn the steps as you go with one-on-one instruction. 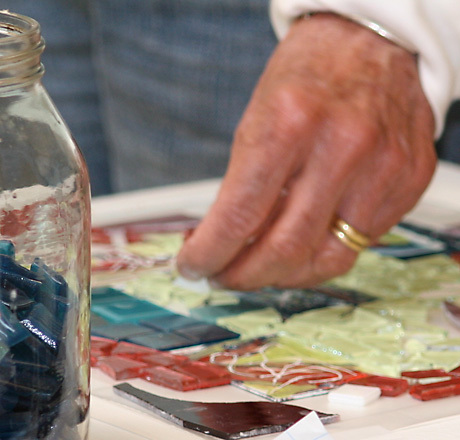 Take a class: If you prefer learning in a scheduled class-like setting we offer everything from easy starter classes that give you a taste of the process, all the way through to advanced intensive workshops for professional mosaic artists. Independent Study: An alternative to membership, day passes give folks familiar with our studio (previous class or SMA experience required) the opportunity to work independently at the studio, with full access to tools and materials. Host a party or event: Our studio is a lovely space to gather with friends and coworkers. It is a great way to celebrate a birthday or special event as well as team building events. Tiles and Supplies: We have hundreds of gorgeous glass and ceramic tiles in every style and color. Like a kid in a candy store, you can pick and choose as much or as little of any type. We also sell all basic tools and supplies mosaics. Custom Designed Mosaics: SMA Studios, the production arm of Seattle Mosaic Arts, creates custom architectural and fine art mosaics for personal and commercial use. Options for Kids: In general, our studio is geared to adults. Children over 12 are welcome with adult supervision. Several Sundays a month we make the studio safe from shards of glass and welcome younger artists to come with an adult to make mosaics in the studio space. Price varies per project. See our upcoming schedule Kid-Friendly Hours. We also offer party kits and other take home projects for your young artists to design at home and bring back for us to cement and grout. We’re on Facebook and would love if you’d “Like” us!